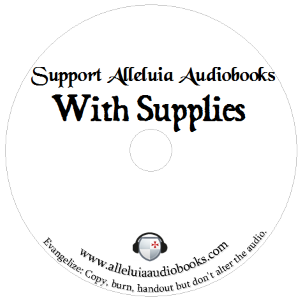 In addition to our website Alleluia Audiobooks distributes free Catholic Audiobooks on CD at Catholic parishes, centers, conferences, and occasionally by people contacting us through the website and asking for the audiobooks on CD. We do not ask for cash donations (though we do accept them), when we distribute our CD’s. Costs are kept down by making the Catholic CD’s ourselves and using work that is royalty free. It is also our hope that others will make copies of the CD’s we give out and distribute those to their friends and family. If you find these audiobooks helpful to your spiritual life please consider making a donation to us by purchasing some supplies off of our amazon wishlist. We hope greatly to increase the amount of CD’s handed out for free this year. Thank you for your help and God Reward you!